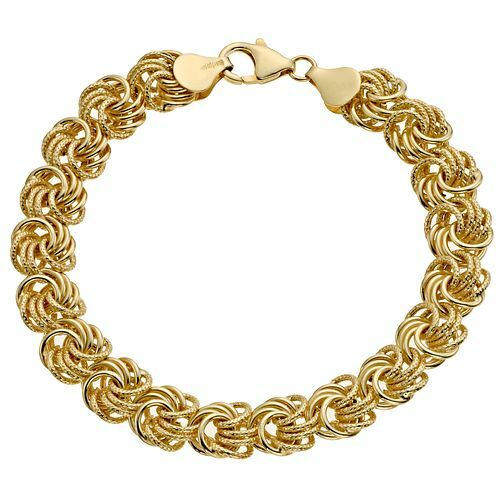 Together Bonded silver and 9ct yellow gold chunky 8" link bracelet. Make a statement with this stylish design and keep other accessories to a minimum for effortless style. Together Bonded Silver & 9ct Yellow Gold Swirl Link Bracelet is rated 3.0 out of 5 by 2. Rated 1 out of 5 by Anonymous from poor quality I bought this bracelet 14 months ago and the links started to break up. I took it back to the shop and I was told that this bracelet was not supposed to be worn all the time and that this damage was classed as wear and tear!!! This was never mentioned to me at the time I bought it. Also I paid a lot more for it than the price it is on sale for now. Rated 5 out of 5 by Anonymous from Lovely Quality. We bought this for our mother, for her birthday. It's is absolutely beautiful. Lovely quality. Fully recommend this bracelet.